In connection with the February business meeting, the Community Service Committee is working with the Greater Chicago Food Depository. The Food Depository is Chicago’s food bank, partnering with over 700 agencies and programs including pantries, soup kitchens, shelters and responses for children, older adults and veterans. This network distributes food where it is needed most throughout Cook County. Every day they distribute the equivalent of 164,000 meals and they rely on donors & volunteers to make it happen. 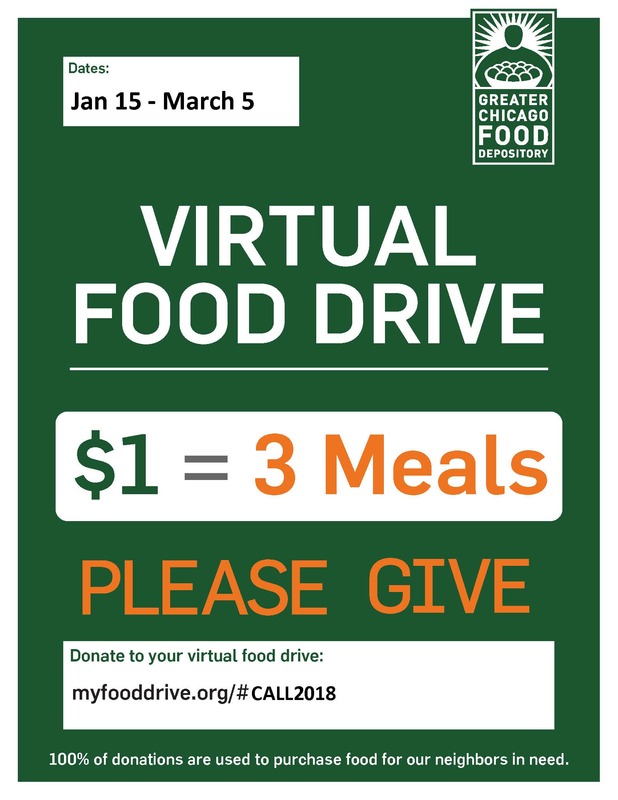 CALL is offering several opportunities to help the Food Depository. Food donations: Please bring any nonperishable canned and packaged foods (no glass) that have yet to expire to the business meeting. Most needed items include: Peanut Butter, Canned Beans, Canned Chili, Canned Soup, Canned Fruit & Vegetables, Canned Fish. 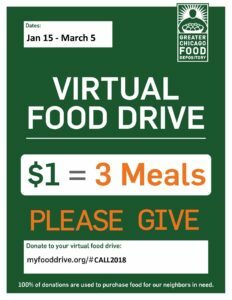 Volunteer Day at the Food Depository: CALL members have an opportunity to donate their time during a Repack Session at the Food Depository on Saturday, March 3, 2018 from 1:00 PM to 3:45 PM. The Food Depository is located at 4100 W Ann Lurie Place Chicago, IL 60632. All volunteers need to register with GCFD, which includes an Electronic Waiver. Description of volunteer duties: The Greater Chicago Food Depository regularly needs volunteers to help with repacking donated food and other products. The repack session is a great introduction to the Greater Chicago Food Depository, the work we do here, and the need that we see in Cook County. A lot of the food we receive at our warehouse comes in bulk quantities and volunteers are scheduled to help us break it down into more manageable sizes. In a repack session you might be sorting produce, looking over a shipment of bread, or repacking bulk dry goods (cereal, pasta, rice) into smaller quantities. Together, we can properly and efficiently distribute quality food to participating food pantries, soup kitchens and shelters in Cook County. The minimum age to volunteer is 14 years old and 14-15 years old must be accompanied by an adult chaperone (who must also register). Parking: Please park on either Karlov or Keeler – the streets east and west of our building. They are meter-free and Karlov usually has closer parking spaces. The parking lot is open to volunteers during Saturday sessions.